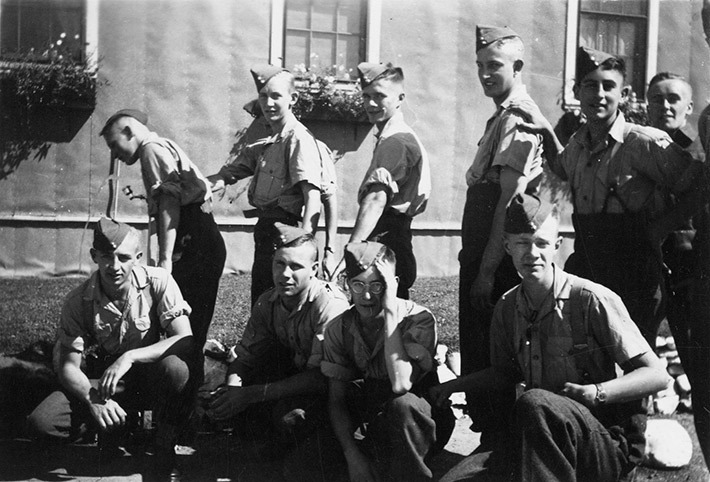 Photograph of members of an army platoon, Royal Winnipeg Rifles, in front of their barracks, ca.1943. Unclear if the location is Petawawa, where the platoon trained for a period of time, and also the location of internment for ca. 600 Italian Canadians. Rino Albanese is standing in the back row, second from the right. At the age of 18, Rino Albanese and his twin Philip enlisted in active service with the Canadian military. At the same time, the twin's father, Giovanni was designated as an enemy alien. The brothers were sent overseas where they served with the Canadian forces in England, Holland, and Germany. A few C.A.V.C. fellows / from our Ptn. taking / a drink after a hard period / of drill. I am in it too.